VersaFine Clair Nocturne is a perfect ink to create a work of art dealing with evening or night. 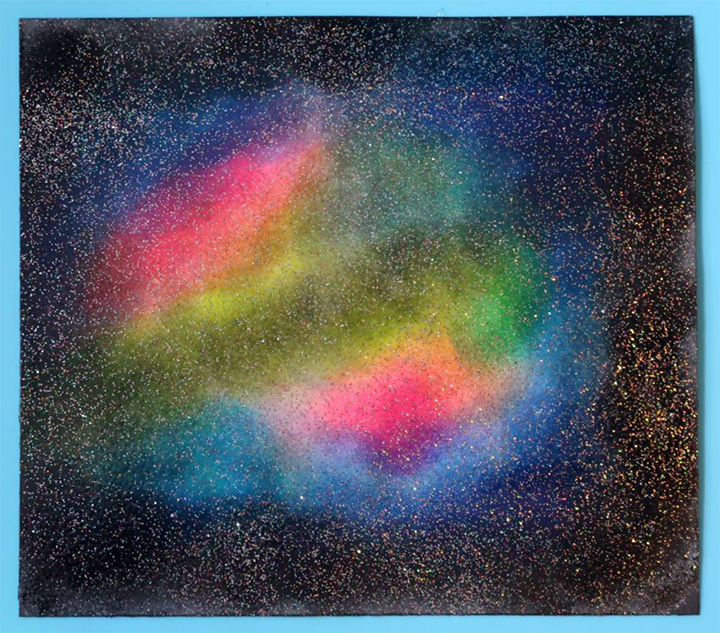 It is especially great for a dreamy pensive composition for the cosmos. I learned this Northern Lights technique but I wanted to put my own spin on it to take it to the next level. See how I did it! Cut a piece of white cardstock a bit larger than the desired finished size. Sponge 2 or more colors of VersaFine Clair ink in a random pattern over the cardstock panel blending each color into the last. Here I used Blue Belle, Charming Pink, Paradise, Verdant and Nocturne. Sponge VersaFine Nocturne (black) ink around the edges of the card panel working it towards the center. 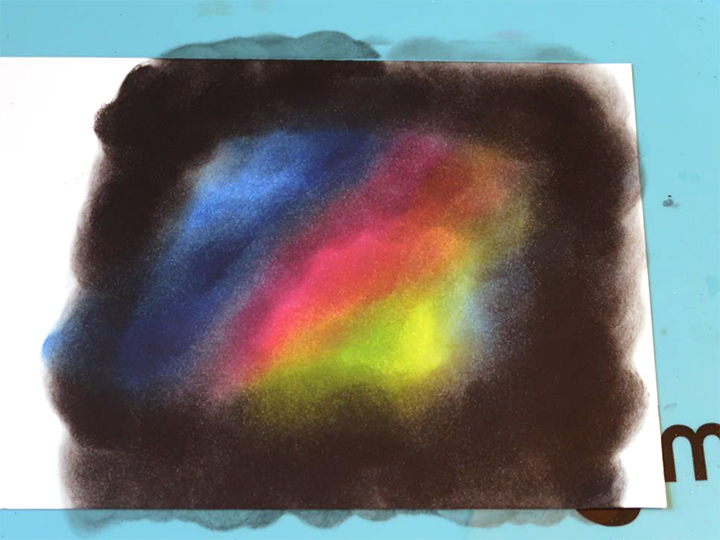 Sponge a lighter layer of black in over select areas of the colored inks. 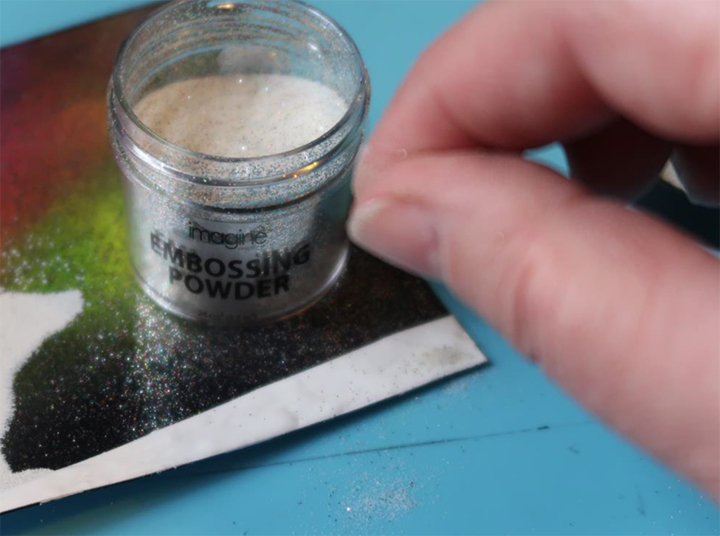 Sprinkle Imagine’s Embossing Powder in Sparkle over the entire inked card panel, shake off excess and return it to the jar. 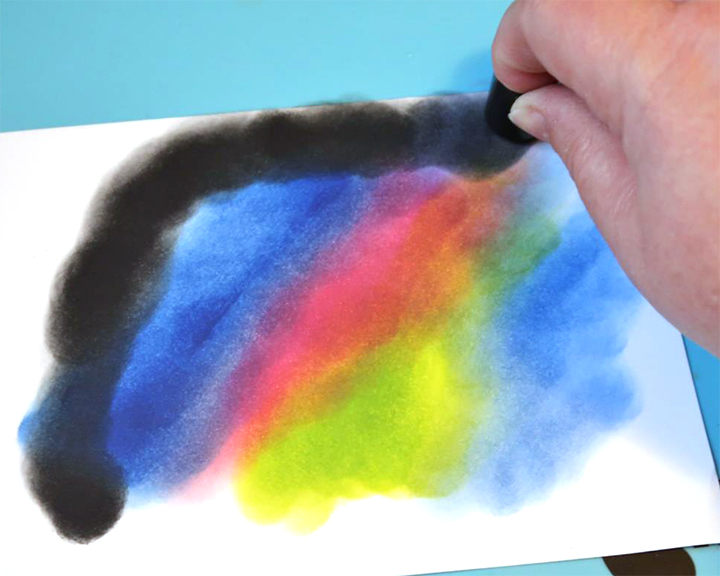 Due to the unique characteristics of VersaFine Clair the ink will feel dry to the touch yet retain the ability to be embossed as an ordinary wet pigment ink. Heat the embossing powder to melt. 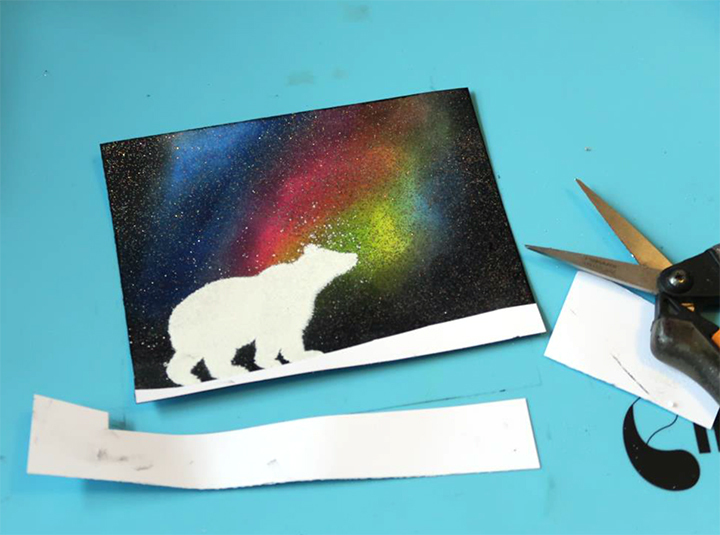 The results look like a starry night spent under Mother Nature’s very own spectacular light show! So fun to create this texture. Now it is time to take this awesome background and make it into a card design. This past December (2017) I participated in Carve December on Instagram. So as a result I have this cute hand carved stamp of a polar bear. There are plenty of bear themed stamps out there so certain find one that best suits this project. 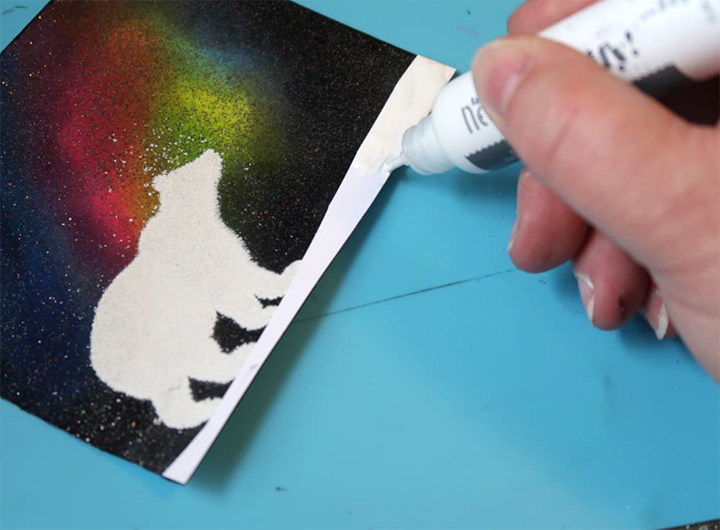 Stamp polar bear image along the bottom of the Northern Lights panel using VersaMark Ink. 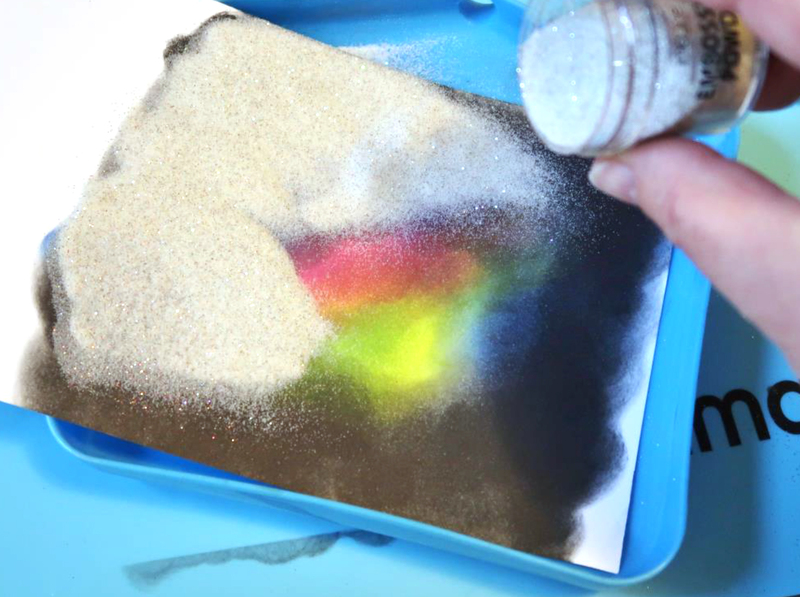 Sprinkle white embossing powder over the image, shake off excess powder and return it to the jar. Heat the embossing powder to melt. Cut a snowbank hill on a piece of scrap paper and adhere it to the bottom of the panel. Apply White Radiant Neon Amplify! to the paper. 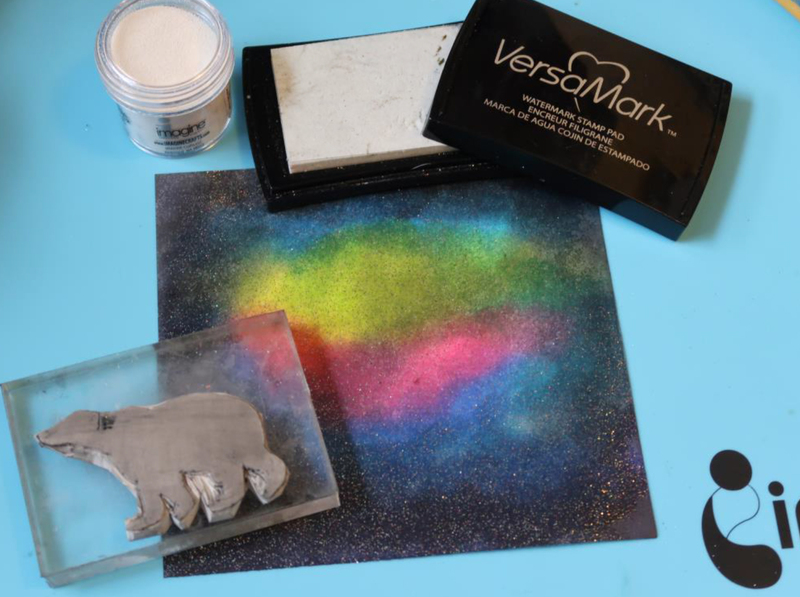 Sprinkle Sparkle embossing powder over the wet Amplify! medium. Use heat tool to activate and puff the medium. Mount the panel on black card blank. Stamp and emboss the “Happy New Year” sentiment on strip of white cardstock and adhere to card. 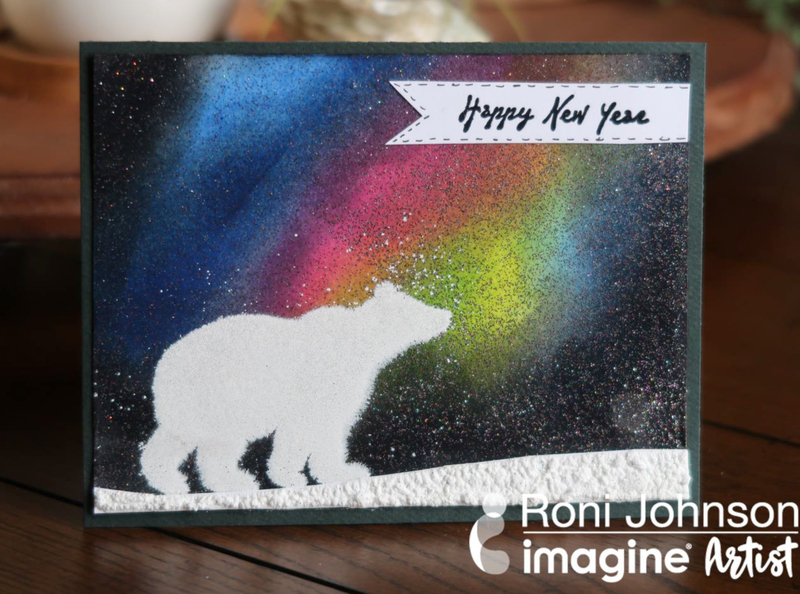 This entry was posted in 2018 ARTIST IN RESIDENCE, Cards, DIFFICULTY LEVEL, DIY, Embossing, INSPIRATION, Intermediate, PROJECTS, Roni Johnson, Techniques and tagged cardmaking, Cards, Embossing Powder, Paper Crafting, VersaFine Clair, VersaMark. Bookmark the permalink. Such a cool technique Roni!! Love it! Thank you Marie, glad you like it. I absolutely love this card. The background is awesome! I definitely want to try this. I’ll be saving for the ink, it looks great! You won’t be disappointed, the VersaFine Clair inks are amazing!